Which five previously ranked teams could miss the NCAA Tournament? Welcome to February. It’s officially time to panic if your favorite college basketball team doesn’t have a stellar record. A lot can change from now until Selection Sunday – and sometimes not for the better. Few things in sports feel worse than being left out of the 68-team NCAA Tournament field. It’s like watching a house party from the outside. Five teams who were previously ranked might be left out in the cold if they don’t turn themselves around soon. Here are the schools jeopardizing their chances. Indiana picked up a much-needed triple overtime home win against Penn State Wednesday night, but it’s still in trouble. Remember when Indiana opened the season by edging then-No. 3 Kansas in a 103-99 overtime thriller? It was in November, but it feels like that happened in the Stone Age. Since late December, the Hoosiers are 5-7, including being curb-stomped at Michigan last week by 30 points. Their last quality victory was two months ago against at home against then-No. 3 North Carolina. Victories over Kansas and North Carolina are enough to put the Hoosiers in the NCAA field right now, but they probably don’t want to push their luck. The NCAA selection committee plays close attention to how you’re playing down the stretch. Yes, IU is wounded. It has lost OG Anunoby for the season and James Blackmon Jr. is out indefinitely. A lack of depth has hurt a team that was already weak on defense. 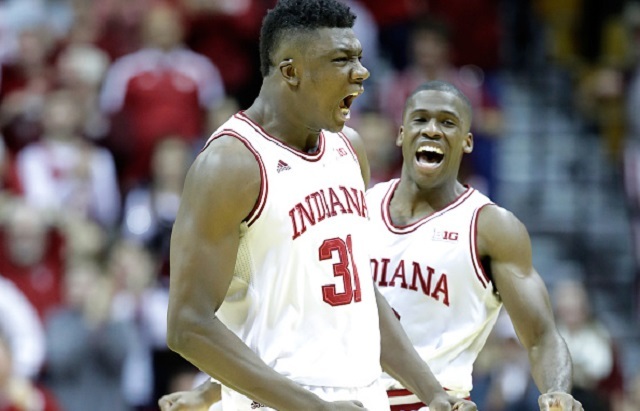 The Hoosiers are third-worst among Big Ten teams in defensive efficiency. IU has eight games left in the regular-season with five on the road. That’s a problem for a team that is only 1-4 on the road. Its lone road win was at Penn State in a game that they needed a buzzer-beating 3-pointer from Blackmon to win. Michigan State has qualified for the NCAA Tournament for 19 straight seasons. Tom Izzo is Mr. Final Four (seven trips to the national semifinals). But these Spartans might achieve something that hasn’t happened to the program since 1997. In Izzo’s second season, the Spartans went 17-12 and went to the NIT. Now on #ValentiAndFoster; Mike Valenti thinks Michigan State will miss the tournament this season. Do you agree with him? Like Indiana, Michigan State has been hurt by injuries. Miles Bridges (ankle), Gavin Schilling (knee) and Ben Carter (knee) have all been hurt. Bridges has been terrific, averaging 16.3 points, 8.5 rebounds and shooting 49.0 percent, plus 41.4 from 3-point range. But he has played just 15 games. And like Indiana, Michigan State is bad on the road (1-3). Izzo has a young team, but in college basketball today that’s not a viable excuse. It looks like seven or eight teams from the Big Ten will make the field. The Spartans probably need to finish above .500 to make the Tournament. California was supposed to be a possible contender in the Pac-12. The Bears were picked fourth in the conference’s preseason poll. Sophomore Ivan Rabb returned to school instead of going to the NBA. Senior guard Jabari Bird, a former five-star prospect, was also back. The Bears were ranked for one week until they lost to San Diego State. They don’t have any truly terrible losses, but beating Southern Cal at home is their only marquee victory. Cal almost lost home overtime games to Louisiana Tech and UC Irvine. The Pac-12 has four teams probably in: UCLA, USC, Oregon and Arizona. It’s going to be a dogfight for that fifth and final team. Utah (15-6, 6-3) and California, who face each other Thursday, are probably going to battle it out to down the stretch. The Bears have nine games left with four at home. They will play at Arizona and host Oregon. They also have two games with Utah. California might have to beat Oregon and at least split with the Utes to get in. The Pac-12 won’t get a lot of respect. According to sagarin.com, it’s the worst among the six power basketball conferences. When you’re not among the six major college basketball conferences, you don’t have a lot of room for error. That’s the spot Rhode Island finds itself in because they aren’t any ranked teams in the A10. The Rams were in the preseason top 25 of the AP and coaches polls. The lone Atlantic 10 representative had four starters returning, including guard E.C. Matthews, who missed last season due to a knee injury. Matthews has been good (15.4 ppg), but Rhode Island has been inconsistent. The Rams are 2-5 away on the road and its sole home loss, an 87-75 defeat to La Salle, might cost them an at-large bid. They are behind Richmond, VCU and Dayton in the standings. The conference looks like it will get a maximum of three bids and might only get three. Rhode Island has key home games against Dayton (Feb. 10) and VCU (Feb. 25) remaining. The good news is that Iowa State plays in the Big 12, where they will have ample opportunities to boost their résumé. According to sagarin.com, it’s the best conference, ahead of the ACC. Iowa State is 4-5 against the top 50, but there really isn’t a marquee victory here. And losing to Vanderbilt last weekend didn’t help. Iowa State looks like it’s an No. 8 or No. 9 seed, which puts it in a dangerous area. That means the Cyclones are only a few bad losses from falling out of tournament consideration. The end of the season stretch will tell you a lot about this team. In the final six, the Cyclones will travel to Kansas State, are at home vs. Baylor and visit West Virginia.